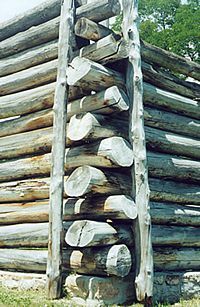 Frontier forts were typically made of huge logs. 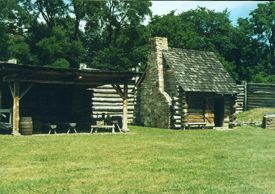 In this case, the logs are set horizontally, stacked on top of one another to form a strong structure. It would take a cannon to damage these walls! When these huge gates were closed, the fort would protect those on the inside from the enemy. 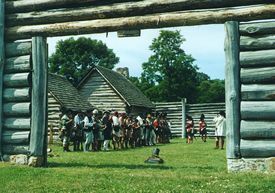 Inside the fort, you can see several buildings. What do you think these were for?